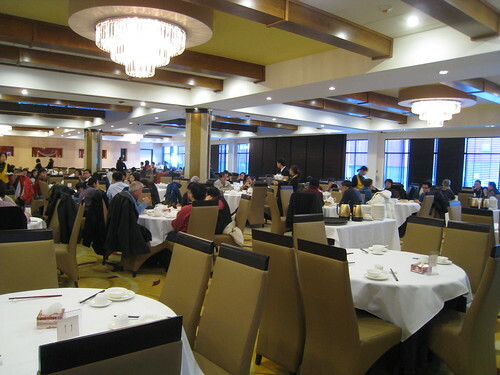 Emperor’s Palace, the newest addition to Chinatown, mirrors Urban China in many ways. Clean and modern, they are both a part of a movement towards the kind of restaurants Vancouver (and Calgary, to some extent) already have down pat. We’re always looking for new dim sum places, so it made sense that my first two meals there were for just that: I checked out the restaurant once during the lunch rush on a weekday before Christmas with Dickson, and again a few weeks later for brunch with Mack and my family to celebrate Felicia’s birthday. The high-backed chairs were visually appealing, and comfortable to boot, but unfortunately, did take up a lot of space, which prevented carts from going between some tables. This wasn’t a problem when dining with my family, but at a small table with Dickson at the rear of the restaurant, two tables stood between us and the aisle. As a result, the verbal exchanges between us and the waitress were a bit comical – we were nearly shouting to be heard above the lunchtime din. The food was a mixed bag on both occasions, with portion sizes far from generous. 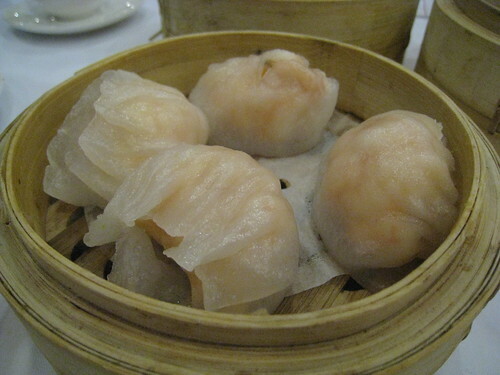 The shrimp dumplings were all right, but they had paper-thin skins; my preference is a thicker shell. 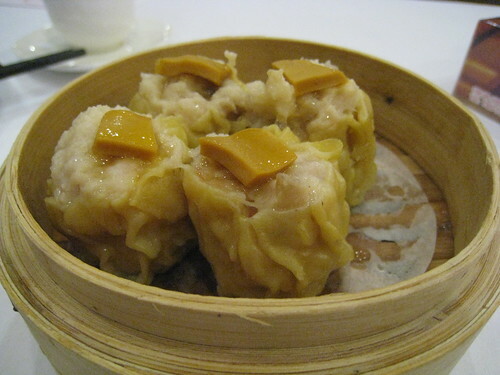 The pork dumplings, another dim sum staple, were disappointing – too chewy. 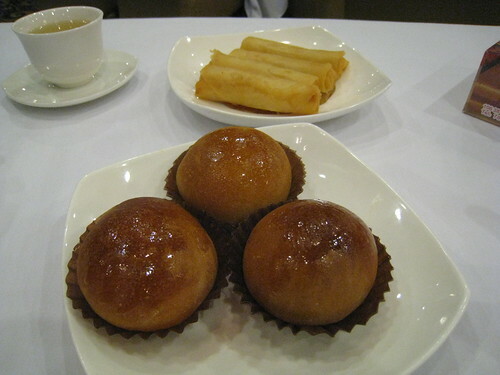 The BBQ pork buns were perfectly shaped and browned, but the bread was dry and unappealing. 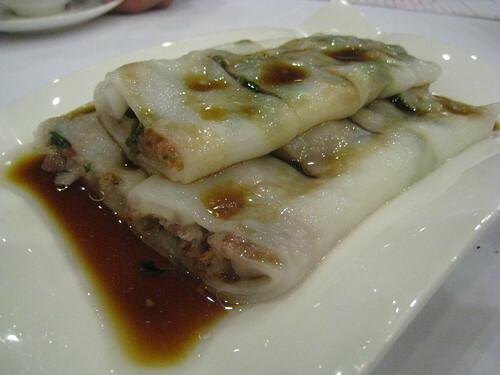 The temperature of the dishes also varied (albeit better at brunch than at lunch) – the rice wrap with BBQ pork, for example, was served to us lukewarm. 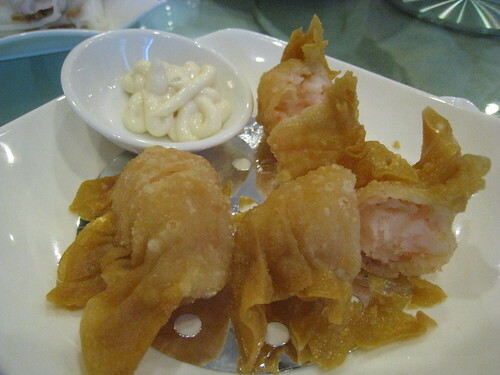 But we were surprised by other dishes – the spring rolls, for example, contained no filler, only shrimp. Hot and crispy, the skin was decidedly light in colour, and not the deep brown characteristic of a bath of old oil. 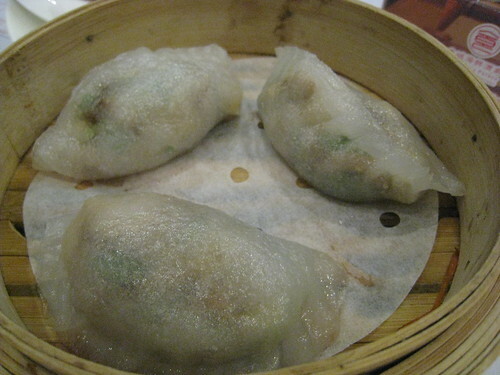 A dumpling with pork, peanuts and chives had great texture. Rolls made of dough and sticky rice were new to me, delightfully garnished with what we took to be greens and egg. 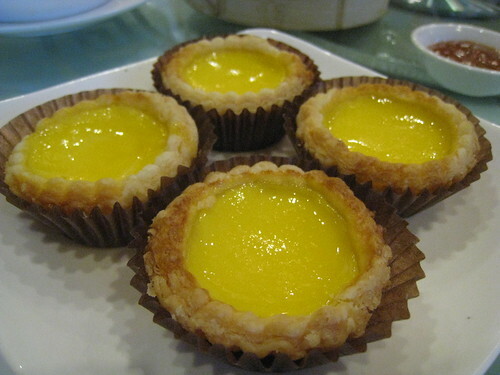 I also thoroughly enjoyed their custard tarts – but then again, I’m a sucker for warm custard tarts! My sister and I both have a bit of a Chinese restaurant restroom fetish, but I’m sure I’m not alone in having a negative connotation of dive-bar restrooms in association with Chinese restaurants. 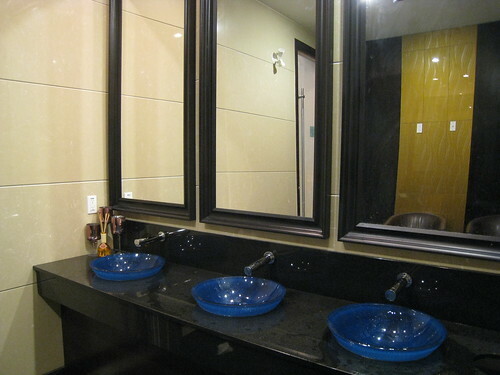 Emperor’s Palace joins Urban China on the short list of nice washrooms, with lovely azure bowl sinks. 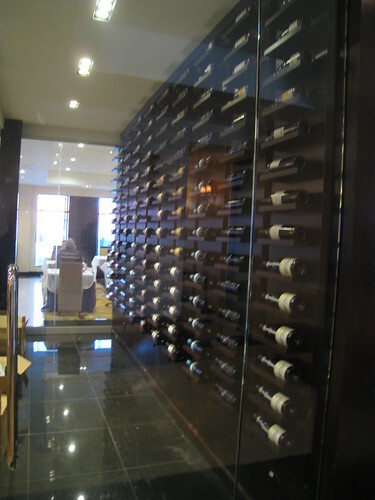 As a whole, though the décor is fabulous, the dim sum was only average. 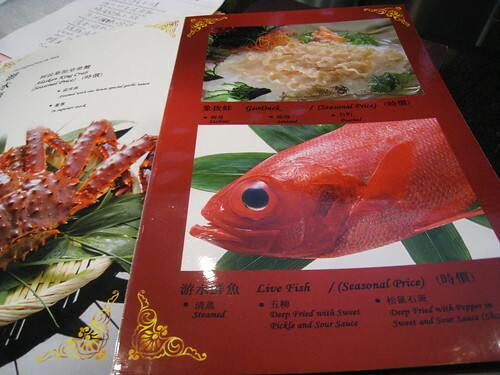 That said, flipping through their dinner menu (a huge, cardboard book), I think it would be worth a try, with options like squab and geoduck available. 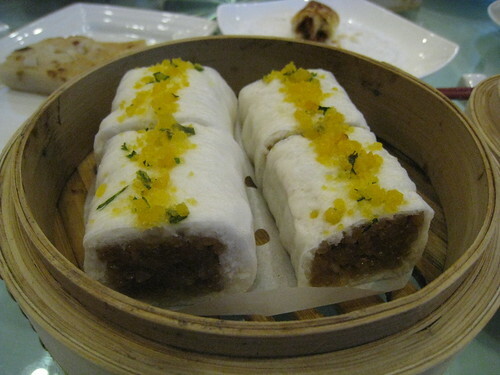 So go for the decor, but as far as dim sum is concerned, don’t expect to be blown away.